SoftPlanet makes it possible for everyone to get free Blues Media Player download directly from our servers. There is no registration needed for downloading. Blues Media Player 24.08.2013 is a completely free video and audio player with a large number of useful features. This program combines functions for playing a number of multimedia files and tries to compete with other popular players by combining essential features that allow users to play various video and audio files with just one software tool instead of using at least two. It also comes with audio and video converters and a large number of options that make it a rather versatile and flexible piece of software. By using it you may just save yourself some hassle which includes looking for players for various file formats. In a few words this is a nice app that tries to do everything for you. 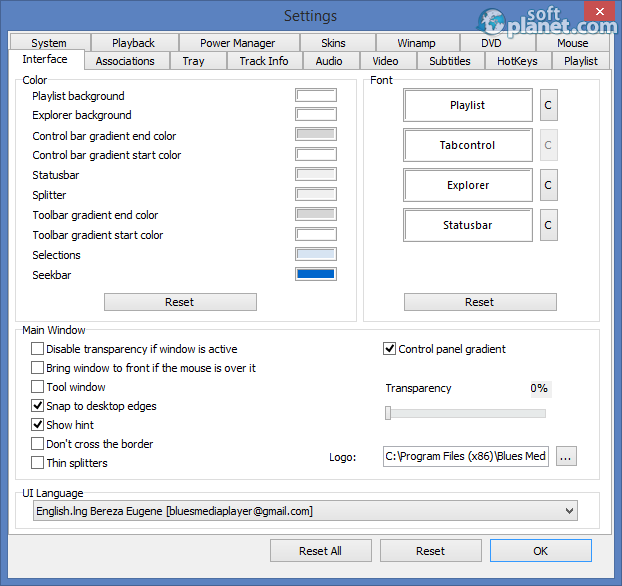 Blues Media Player 24.08.2013 does have a number of really useful features that make this program an almost universal multimedia tool for playing various kinds of video and audio files. The program comes with a simple interface that will take you no more than a few minutes to understand and figure out. In addition the program comes with a number of useful functions that include built-in file format converters, a ton of options that make this app rather flexible and useful and support for CD, DVD and BD disks. The interface of Blues Media Player 24.08.2013 is not impressive. It's not bad by all means but it does not look great and just by looking at it you can see that you work with a third-party software tool. Just like with many other Windows programs you get a File-Help list of menus in the upper left corner. There are also three major areas of interface just below the menu list – the first one gives a tree-like overview of your system folders and files, while the second one, which is to the right of the first one shows information about the file, which is being played at the moment. The area just below the tree-like file structure is reserved for playing videos. It is small by default but this does not mean you can't watch videos with this software tool – quite on the contrary! You can expand this area with your mouse and watch videos and even movies just fine. The intuitive Blues Media Player 24.08.2013 interface makes it very easy to work with this software. You can select the files you want to play from the tree-like file structure in the upper left corner of the program window. If you want to watch a video file you will have this opportunity in the small display window in the lower left corner of the program window; as to audio files they play with this program and all you have to do is just listen to them. You also get an integrated music player at the very bottom of the program window. To be honest though, this tool did not play MP4 or FLV files so it does not support certain file formats. Still if you bump into one of these just use the integrated file format converters and you will be fine. 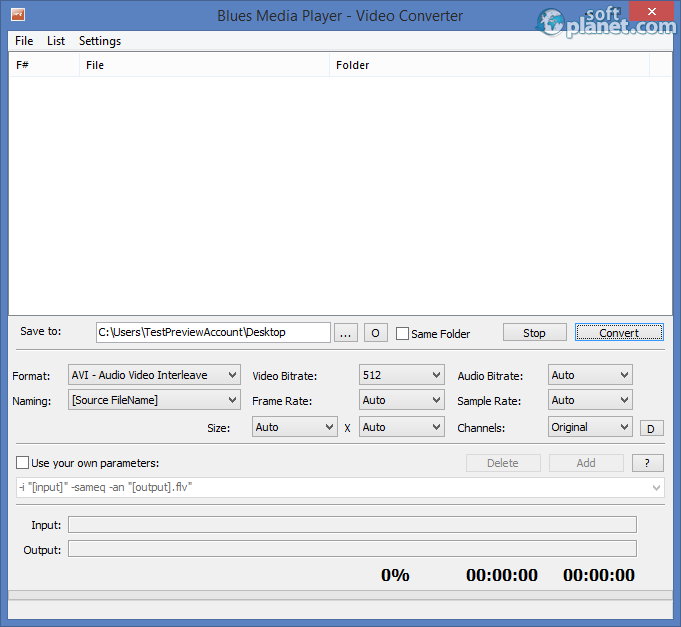 Blues Media Player is a nice software tool that plays a wide variety of audio and video files. It tries to combine the features of various audio and video files players and works as a universal tool saving you time and effort. The problems with this software program are two though – its setup process tries to fill your computer with junk software; in addition some file formats are not supported but if you encounter such a file you can use the integrated file format converters. In a few words this is an app worth some attention so grab it from our web site and see if you like it! Blues Media Player is VIRUS-FREE! Our security scan shows that Blues Media Player is clean from viruses. The current version of Blues Media Player has been scanned by our system, which contains 46 different anti-virus algorithms. That ensures that Blues Media Player 24.08.2013 is 100% safe for your computer.